A LITTLE OVER three years ago, Maciej Tarnogrodzki sat down with The42 for an in-depth conversation on Irish football. The topics discussed included Irish parents’ behaviour on the sidelines, some coaches’ tendency to restrict creative players and many people’s lack of faith in the League of Ireland and its footballers. Now seems an appropriate time for a catch-up. Irish football appears to be in the midst of a transitional phase. With the Martin O’Neill era over, Stephen Kenny, a coach who made his name in domestic football, is set to be manager of the Boys in Green after Euro 2020. Tarnogrodzki agrees that plenty has changed since our last chat. Personally, he is in a different space too. Back in 2015, he was Bray U19s boss and had recently come off a short stint managing the club’s senior side on an interim basis. 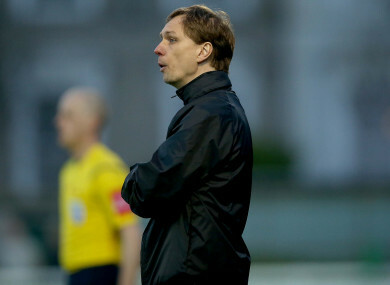 Now, he is in charge of UCD U19s and last year acquired his Uefa Pro Licence. The coach, who was born in Poland and had a promising playing career in the game cut short by injury problems, has lived in Ireland for nearly 20 years. Much of this time has been devoted to managing various teams at underage level, though as with many League of Ireland coaches and some players, he combines this work with a day job (in Microsoft). The conversation begins with a discussion on what has changed since 2015. Underage leagues from U13 to U19 have developed, as FAI High Performance Director Ruud Dokter’s ideas increasingly take shape. Of course, some familiar problems persist. No current Irish player could be identified as world-class, despite the emergence of some promising youngsters. However, Tarnogrodzki believes there is a need for patience in relation to the current development plans. If you look at other nations, they put together a plan and they have to wait eight to 10 years to bear the fruits. In Ireland’s case, it may be even longer,” he says. Of course, that is not to say everything is perfect. As someone who has worked as a coach at underage level for many years, Tarnogrodzki says the funding required to provide the top coaches and facilities isn’t always there, with short-term thinking in the past often undermining clubs’ wellbeing. Another issue is the many traditionalists in Irish football eager to maintain the status quo. For instance, an FAI instruction for summer football to be fully operational by 2020 — a plan that Tarnogrodzki and many others have been advocating for quite some time — has been met with a decidedly mixed reaction. I’ve been in Ireland for 18 years, I love the country and people in general, but in football there is a lot of negativity,” he says. “I don’t know where this is coming from, but that’s the way it is. Of course those voices are heard, but the situation is that people don’t like changes. What has also changed to a degree is the mentality of younger players. Whereas a decade ago, staying in Ireland would have been inconceivable to the most promising footballers who were invariably hoovered up and often subsequently spat out by the top English clubs, now individuals such as Ryan Manning, Gavin Bazunu and Neil Farrugia are content to stay at home and complete the Leaving Cert before contemplating moving across the water. Of course, there are still those unable to resist the lure of English football at the first available opportunity, but leaving Ireland is no longer the no-brainer decision it was once perceived as being. And Tarnogrodzki believes the Irish football system has helped facilitate this change. Tarnogrodzki feels this lack of belief in Irish footballers was evident in people’s changing perceptions of his UCD U19s team. He believes this problem of perception extends to young League of Ireland coaches. A sceptic might quip that Tarnogrodzki’s argument is driven purely by self-interest. However, he rejects such claims and feels Ireland has been slow to learn lessons from countries such as Germany and Spain, where the best youth coaches are routinely promoted to first-team positions. “If we look across Europe — Germany or Spain, some of the biggest leagues in the world, [there are many] managers who started as a youth coach. “Thomas Tuchel, now coaching PSG, he spent a number of years as a youth coach — five years at Stuttgart at U19s, three years at Augsburg and then he went to Mainz in the Bundesliga. You have Julian Nagelsmann at Hoffenheim, 31-years-old. He spent many years at youth level. Roughly 50% of the Bundesliga and other [leagues] are coming from youth systems. If they produce players, they get the chance. But this is coming from a higher level of knowledge of people who run the clubs. It’s just a different level. “In Ireland, being a youth coach for a number of years and making tactical decisions, managing teams, human beings, it is not perceived as an asset. “I’m not saying it always has to be youth coaches [who are promoted], but there has to be some progression. It’s not that older managers are not wanted. Tarnogrodzki himself is hopeful of managing at the top level one day either in the League of Ireland or elsewhere, but also insists he is content with the present situation. One example of an Irish underage coach who has sought to move elsewhere is Damien Duff. The former Blackburn and Chelsea winger began his life on the sidelines with Shamrock Rovers, before recently taking up a role at Celtic. Tarnogrodzki listened with interest to Duff’s comments last year on Irish underage football, and his suggestion that the majority of the country’s youngsters don’t train often enough. “There is no question, if you want to become a footballer, you need to love the ball, to touch football or play football all the time if possible,” he saying, agreeing with the basic premise of Duff’s argument. “It doesn’t mean it has to be done at club level. I understand with social media now, it’s not the same as it was before when players were playing on the street. Before, the biggest players in the world were not produced through structured academies. Even now, the best players sometimes went through their youth without proper coaching and just played on the streets for five or six hours a day. “There is not enough of a professional approach in general to be able to train every day within the clubs [in Ireland]. There is no proper structure apart maybe from one or two clubs. In Ireland, it’s difficult with it not being full-time, to train five times a week, but it doesn’t mean that you cannot train every day. “To be a good footballer, with young players, it’s [also] coming from parents. I have a son, I don’t know if he’s going to be a footballer, but the football is everywhere at home. He’s one and a half years old. He’s kicking the ball in the kitchen. He’s kicking the ball in the living room. And that’s how you programme children, to give them love. There are many aspects to [making] it — character and drive and things like that — but I’m talking about the context. The problem all goes back, he suggests, to the negative mindset that afflicts football in this country and elsewhere. “Of course, to become a footballer, it’s a road with obstacles. You need to have a strong mentality. But it shouldn’t be perceived as a struggle. There was a movie [about underage footballers in England] — I watched 15 minutes of it and had to switch off. I thought I would never want my son to perceive football in that way [as a struggle]. It’s exactly how you perceive life. Of course you will have sickness and death, but if you have a positive outlook, life is going to be much better for you. It’s the same with football. In addition, while coaches cannot make bad players good and vice versa, Tarnogrodzki insists they can still have a major impact on their development ultimately. “In Germany, when they have a young striker who wins games at U16s, is very quick and scoring a lot of goals and basically wins games by himself, if they recognise that this player is missing game understanding and lacks awareness, they are willing to sacrifice [the team's short-term goals] for the sake of his future development — to put him in a different position, for example, number six. “It’s not always easy, because players are not used it. They just want to be in one position, so that has to be explained in a constructive manner. But I hear voices across the years [who suggest] just to maintain what he’s good at. If you have the mentality of thinking just to maintain what he’s good at, because he’s a winger who can get the ball and cross very well at 16 or 17, you are limiting the potential of players. Email “'I've been in Ireland for 18 years, I love the country, but in football there is a lot of negativity'”. Feedback on “'I've been in Ireland for 18 years, I love the country, but in football there is a lot of negativity'”.